Make and Craft present Maker Faire 2010, the world’s largest DIY festival, which returns to San Mateo County Expo Center for its 5th year on Saturday, May 22nd and Sunday, May 23rd. 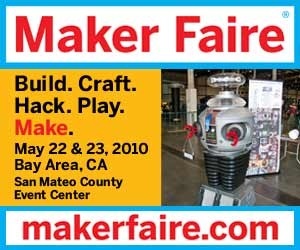 Here are my photos from Maker Faire Bay Area 2009. This year there will also be a Maker Faire in Detroit (July 31st & August 1st) and New York City (September 25-26).